Welcome to Children’s Book World! Children’s Book World is an independent, full-service children’s bookstore featuring a comprehensive inventory, knowledgeable staff, and exciting events. Children’s Book World opened its doors for the first time in July, 1989—and now, thirty years later, we’re going strong! Ace of Shades has it all — incredible worldbuilding, cinematic set-pieces, heart-pounding pacing and unpredictable, deliciously messy characters. Foody’s impressive and ambitious vision for the “City of Sin” will linger in my senses for a long time. An utter delight. 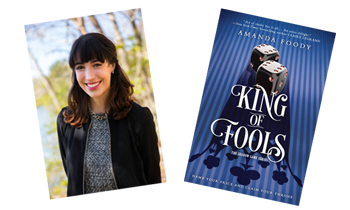 YA Fantasy fans will not want to miss this one — come and celebrate the release of Amanda’s new book on Tuesday, April 30 at 7pm! If you can not attend this event, use the button below to order your copy of King of Fools by Amanda Foody.